New book, 80 pages, SS12058. The United States manufacturers produced more than 40,000 halftracks from 1933 until 1944. These mostly-armored vehicles moved artillery and infantry on rough terrain, snow and sand during World War II and Korea. 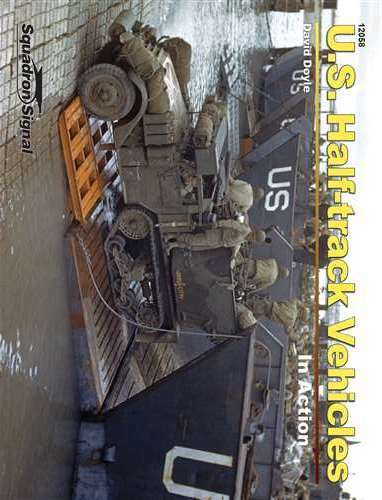 Based on an adaptation of the White Scout Car, the US half-track vehicles combined the cross-country ability of a fully-tracked vehicle with the road performance of a medium truck. Variations of these vehicles included prime movers, armored personnel carriers, mortar carriers and a wide range of heavily armed variants. Vehicles produced by Autocar, Diamond T and White were used by U.S. forces, while similar International Harvester-built vehicles were supplied to our Allies through Lend-Lease. Both the Army and Marines took them into battle. They left their mark in Africa, Europe, Pacific islands and Korea. When the U.S. entered Vietnam, French halftracks were already in country. Before retirement, the Israeli Army listed about 600 halftracks in March 2008. Argentina donated its final 24 M9s to Bolivia in 2006. Illustrated with more than 200 photos, two color profiles and 12 line drawings, 80 pages. This item was added to our catalog on Sunday 13 August, 2017.